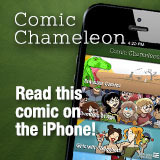 It’s Webcomic Rampage time again next weekend! I’ll be in Austin, Texas, with all of my favorite fellow webcartoonists for a two-day event hosted by Dragon’s Lair Comics and Fantasy. There’s Q&A panels, there’s tables of swag, and there’s hopefully no half-blenders! If you’re in the Austin area, you totes gotta come. Dragon’s Lair is hosting the 3rd Annual Webcomic Rampage at their Austin, TX, location on December 10 and 11! If you want to get into the Q&A panels, you gotta RSVP, as there’s limited room. There is unlimited room for the buyings and signings. Who else besides me will be there? If you need fodder for questions, know that Joel and I will be sharing a hotel room. So you know it’s gonna be pretty wild. Go check it out. The great thing about Randy is that he always makes sure to first get permission from other artists to do these things. Me? I’m usually in the “better to ask forgiveness” camp, and like to surprise other creators with my theft of their intellectual property. He’s an angel. A gentleman. And yet, his webcomic’s way meaner than mine. I’ll be seeing Randy and several of my other most favorite webcomic people December 10 and 11 in Austin, Texas, for Webcomic Rampage. If you’re in that quadrant of Texas, you totally need to come. Hopefully I won’t get stuck with half a blender this time. So this is the infamous half-blender of Webcomic Rampage. For those readers of mine who still haven’t heard this story, let me retell it here. I shipped two boxes of books to the Austin Dragon’s Lair comic shop ahead of myself so that I could sell them to my fans. One box arrived easy-as-you-please! The other box had been opened, books removed, placed in a new box, with the books exchanged with half a blender. HALF A BLENDER. So, yeah. 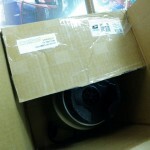 Post Office lost/stole/ate my books, and gave me an incomplete blender in exchange. That was fun! But a good story, I guess? But the sad, sobering reality is that losing those books cost me a potential few hundred dollars in sales. That blows! So to share this story and to help recoup my losses, since there’s no real legal recourse for me to retrieve these books or my lost potential sales, I’ve doodled a bunch of my characters on the surface of this blender with a Sharpie. And you can own it. Keep in mind, it is an INCOMPLETE blender. You will only get what you see here. Just the bottom, with a plug. There’s no top half. The blender also has some scuff marks at some of the edges where its silvery finish was removed in transit. But on the plus side, there’s now all these Shortpacked! and Dumbing of Age characters on it. Sweet, huh? I’ve left a spot up next to Ultra Car where the winner of the blender can request anyone they feel is important that I’ve forgotten. (Which, as it turns out, will probably be Mike. Man, how’d I forget him? Oh well, you can request him should you win. Or somebody else! There’s also no Dorothy, no Reagan, no Sal…) So, uh, yeah! You can own this piece of dubious webcomics history. Time to search, like, eBay for a pile of Shortpacked! books, maybe? Payin’ the post office a visit on Monday, methinks. So here’s a fun Webcomic Rampage story. I’m pretty sure I’ll be telling this one a lot. It’s a doozy. I mailed two boxes of books to Austin. One arrived perfectly! The other arrived, too, but in an interesting condition. 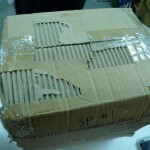 It was, in fact, a completely new cardboard box, with the old, shredded cardboard box inside. The mailing address, return address, and postage had been exacto-knifed off the old box and taped onto the new box. Inside the old box inside the new box was half a blender.